Compare Red Dot vs Prism Scope - When Should We Use Them? →What is Red Dot vs. Prism Scope? When Should We Use Them? Hello everyone. Welcome to our Q&A show. The same as usual, we will choose one of the most exciting questions from weapon enthusiasts. And today, we will answer the question on "Red dot vs. prism scope," "What are their advantages? ", and "When should we use a red dot or a prism scope?". Now we begin with the differences between a red dot and a prism scope. Red dots and prism scopes are both used for Close Quarter Battle (shorten by CQB). They are two different bits of equipment for almost similar purposes. The most significant difference between them is the magnification. While a red dot performs at 1x magnification, the prism scope has the magnification of 1x, 2x, 3x, 4x, or 6x. To compare red dot to prism scope, we can start with the 1x magnification. A red dot has no reticle; it only has a speck floating in the FoV (stands for the field of view). Meanwhile, the prism scope has the design of a reticle carved on the glass. Thanks in large part to this, the shooters can still use the sight even if the illumination fails you or your gun runs out of the battery for any reason. Illumination by both a red dot and a prism scope can be in the red and green colors. However, you can transfer the red into the green or vice versa with a prism scope while with a red dot, you tend to illuminate in the green color over of the red. 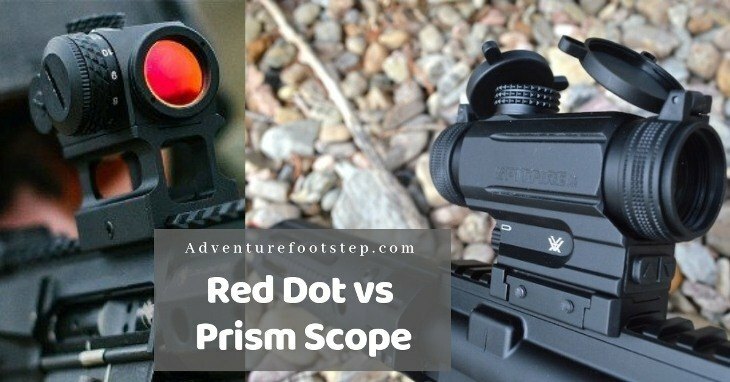 Aside from the different magnifications, there are some other differences between a red dot and prism scope which result in their advantages and disadvantages. With the design of unlimited eye relief and eye box, users can shoot accurately, even if they aren't in an ideal shooting position. Red dot sights give a faster firing in short distances. Have a more compact and smaller design and the ability to look through the scope with both eyes open. If you are planning buy a red dot sight for your Ar, read my post about best red dot sights for AR 15 by click here. With the design of a focusing eyepiece, prism scopes allow users to adjust with different personal visions, resulting in an excellent choice for users face difficulty in using red dots due to astigmatism. 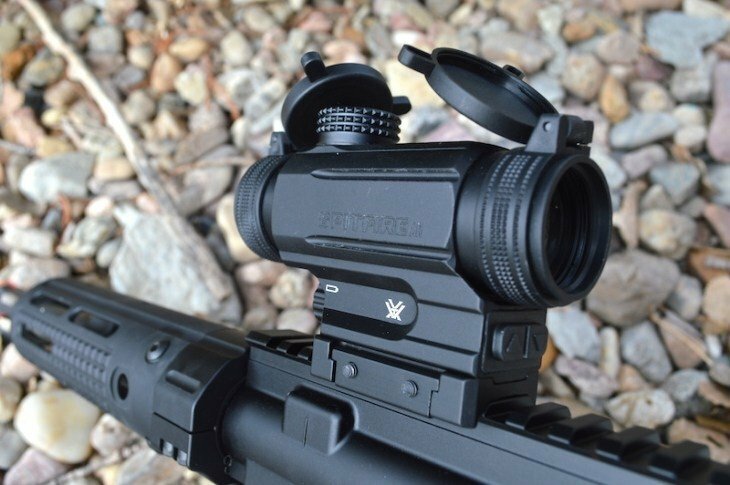 However, prism scopes have shorter and narrower eye reliefs than those of red dot sights. Therefore, it probably makes them unsuitable for gunners or guns requiring added long eye reliefs of 5+ inches. When Should We Use A Red Dot Or A Prism Scope? While you can use red dots in short distances, prism scopes are for the range from close lengths to medium lengths. If you hope to achieve long shooting distances, traditional red dot sights are more suitable for you. They are available with a far larger magnification system. For strategic firing or fast-paced speed, a red dot might be a better option for you. Users can fire it with both eyes opening; it will even be far quicker and more comfortable for users without eye relief. Prism scopes are also suitable for strategic firing. They have a compact design so that they can obtain targets quickly. In case you do normal range firing, a red dot or a prism scope will be both good for you. If you are having a survival rifle or doing hunting, we recommend you to use prism scopes. Their etched reticles will make magnitude helpful despite whether you have the battery or not. Traditional red dots are shorter, lighter, and cheaper. Also, they depend on batteries. So if the source of power dies, they will become useless. On the other hand, prism scopes are longer, heavier, and more expensive. Although they don't need batteries, you cannot use them with a magnifier or backup sights. If you have any questions about this topic, kindly write down in the comment box or send us an e-mail. If you find our Q&A show helpful, please keep visiting our site!